Boko Haram fighters defied Nigerian military security and stormed a major community in Yobe State on Wednesday, leaving at least eight soldiers killed and many others wounded, military sources have told PREMIUM TIMES. In separate interviews with PREMIUM TIMES under anonymity on Friday morning, military officers were troubled by Boko Haram's ability to inflict such damage on an area that had long been fortified to serve as a buffer against unchecked movement of insurgents south of River Komadougou-Yobe. While other Yobe communities, especially Buni Yadi, live in fear of regular Boko Haram attacks, Geidam was relatively calm, which security analysts credit to the military's ability to prevent terrorists from using the nearby river. The assault, which bore markings of Islamic State's elements in Boko Haram, forced several soldiers to flee between Wednesday evening when it began and Thursday morning when it ended. Onyema Nwachukwu, a Nigerian Army colonel and spokesperson for the counter-insurgency unit in Nigeria's North-East, did not return multiple requests for comments from PREMIUM TIMES Friday morning. 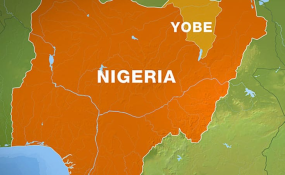 Yobe police commissioner, Abdulmalik Sunmonu, directed all enquiries relating to the Boko Haram attack to the military. Before ending their attack, however, the insurgents took over Goggo Petroleum, a service station in Geidam, "where they loaded petroleum products to their satisfaction," military sources said. The spectre of Boko Haram insurgency, which has seen over 100,000 killed since 2009, however, still looms over Nigeria's political leadership, barely days to another round of general elections. Mr Buhari and his senior official and military chiefs have declared since December 2015 that Boko Haram was "technically defeated" after a sustained counter-insurgency that saw Nigeria retake several local government areas seized by the terrorists since declaring a caliphate in 2014. Yet, on January 9, the president acknowledged setbacks in the counter-insurgency operations, attributing it to "battle fatigue" among soldiers who might not be conversant with the asymmetric nature of the attacks.